Energy Use - Dapwood Furniture Co. It is difficult to imagine living in a world without lighting, automobiles, heating, internet and powered tools. All of these conveniences (some might argue necessities) require some form of energy. Most of the time, the energy source is a fossil fuel. Mankind has been using this energy source for over two hundred years and we feel it is time to move on and fully commit to renewable energy. Research and development of renewable energy sources like solar, wind, geothermal, and hydropower has progressed to the point that it economically viable today and becoming more and more mainstream. It is Dapwood’s desire to set an example and be ‘off the grid’ so we are evaluating the use of solar panels on our shop to produce the electricity we need to operate our equipment daily. Until we can generate our own power, Dapwood participates in our local electric company renewable energy program. PNM Sky Blue uses 200 turbines turned by New Mexico’s plentiful wind energy. PNM has an aggressive program to provide its customers with clean energy and expects to produce about 594,000 megawatt hours of electricity every year that would otherwise need to be generated with fossil fuel or nuclear options. We have moved our web site to a 100% wind powered host- Canvas Host. 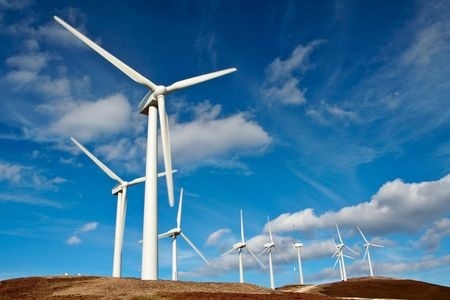 They were the first web host in the Pacific Northwest to use 100% wind power in the operation of their business. They also reduce their power usage by designing and building smaller, high-efficiency servers resulting in 60% energy savings per server for operating and cooling. They are also a fellow Certified B-Corporation. We moved our company in the summer of 2011 to a central location in the city of Albuquerque to cut down on use of gasoline by employees and suppliers. Because of our new convenient location, employees are able to bike to work and get fit while reducing carbon emissions. By helping in the urban renewal of the city’s core we also aid in reducing urban sprawl and its associated higher energy use. Lastly, we use high efficiency fluorescent bulbs and will be converting to higher efficiency LEDs. A little conservation here, a little conservation there leads to a huge positive impact…especially if everyone does it.